Biography: Dr. Jillian Roberts is a renowned child psychologist, author, professor and parent. She earned her PhD at age twenty-six, became one of the youngest associate professors at the University of Victoria at thirty-two and shortly after became the associate dean of the Faculty of Education. During this time Dr. Roberts built one of Victoria, British Columbia's most successful child-psychology practices. Considered a go-to child psychology expert for journalists, Dr. Roberts has had her work published in the New York Times and the Toronto Sun, is a regular contributor to the Huffington Post and Global News, and has been interviewed by The Tyee and the CBC. Her bestselling Just Enough series of children's books was released in 2016 to international acclaim. In early 2017 Dr. Roberts co-founded FamilySparks to offer families a supportive, resource-rich community to help them navigate our increasingly complicated world. For more information, visit drjillianroberts.com. Follow her on Twitter @DrJillRoberts. 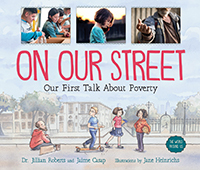 A compassionate look at the complicated topics of homelessness and poverty.